OA#181. From Tracy Jonson, 1910. Bruce Davis, Glenmorrie Park, Oswego, Ore. 2 cal 275 56. 12B, 5 1/2 x 3 1/2 blow-up. Description Sepia photo; creases, dirt. Same as 1640b & 865. 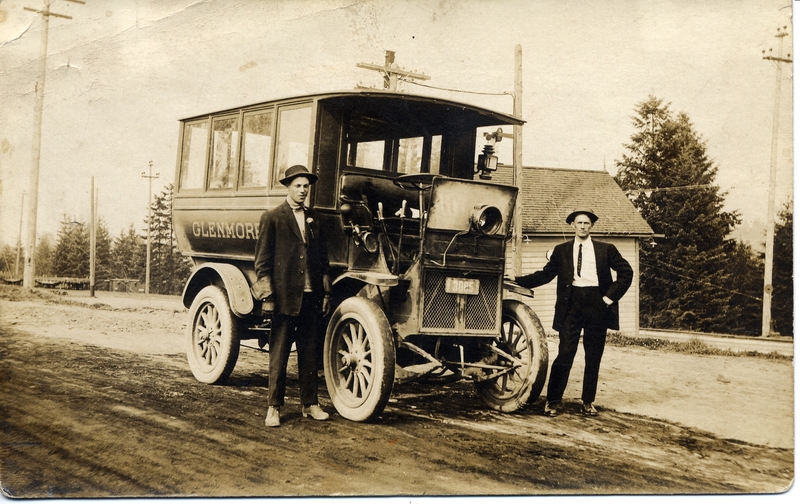 On bus: Glenmor[rie]; license plate: ORE 3085. see photo 1640b for further information. Transcription OA#181. From Tracy Jonson, 1910. Bruce Davis, Glenmorrie Park, Oswego, Ore. 2 cal 275 56. 12B, 5 1/2 x 3 1/2 blow-up.